One of the ways the Palestinian leadership turns terrorists into role models and heroes is by naming summer camps after them. This summer, Palestinian children in the Jerusalem area were able to join a summer camp that was named “the Martyr Baha Alyan Pioneers” - after terrorist Baha Alyan who with an accomplice murdered 3 Israelis on a bus last October. Children from the Bethlehem district were able to join the “Martyr Mamoun Al-Khatib Camp.” Al-Khatib was a 16-year-old terrorist who tried to stab an Israeli civilian on Dec.1, 2015. At the camp named after murderer Alyan, the 11 to 17-year-old participants were to receive “informational visits” by the PLO’s Palestinian Political Guidance Authority and the PA Police, among others. The fact that these official institutions agreed to send speakers to the camp named after a murderer indicates their endorsement of this practice of turning murderers into role models for children. Palestinian Media Watch recently published a report documenting statements by senior Fatah official Jibril Rajoub, glorifying terror and inciting to murder. Rajoub heads the Supreme Council for Youth and Sports, which organized the summer camps. 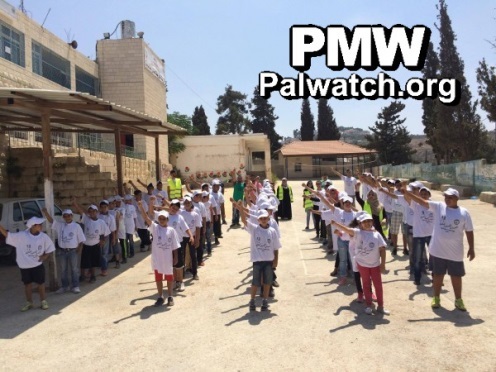 PMW has reported on a scouts' course named after murderer Alyan held by the Palestinian Scout Association and the glorification of the murderer by one of its instructors. Jibril Rajoub is also the chairman of the Palestinian Scout Association. Likewise, events at Palestinian universities have honored Alyan. “Today [Aug. 14, 2016], the Beit Anan Club, under the supervision of the [PLO] Supreme Council for Sport and Youth Affairs (which is headed by Deputy Secretary of the Fatah Central Committee Jibril Rajoub -Ed.) and in partnership with the Jerusalem Suburbs Education Directorate (which is under the PA Ministry of Education-Ed. 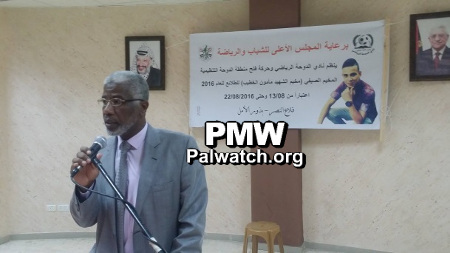 ), launched the activities of the first Free People of Palestine Summer Camp, Martyr (Shahid) Baha Alyan Pioneers, in the village of Beit Anan, northwest of occupied Jerusalem. Baha Alyan and Bilal Ghanem - 22 and 23-year-old Palestinian terrorists who on Oct. 13, 2015, boarded a bus in Jerusalem's Armon Hanatziv neighborhood with a gun and a knife and attacked passengers, killing Israelis Haviv Haim (78) and Alon Govberg (51), and Richard Lakin (76), and wounding 3 Israelis. Alyan was shot and killed by an Israeli security guard at the scene and Ghanem, a Hamas terrorist who served time in Israeli prison in 2013-2014, was wounded. Ghanem is serving 3 life sentences and an additional 60 years for these murders. Headline: "The [PLO] Supreme Council for Youth and Sports opened 104 summer camps"
In the Southern Council, Deputy Secretary-General [of the Southern Council] Najeh Al-Izza opened the Martyr (Shahid) Mamoun Al-Khatib Camp in the city of Al-Dawha in the Bethlehem district, and emphasized that the Supreme Council is focusing on the youth sector, as it is the foundation of the future and the hope of the present. One hundred and twenty boys and girls will participate in the activities of the Martyr Mamoun Al-Khatib Camp, and it will be run by the Al-Dawha Club." Mamoun Ra'ed Muhammad Al-Khatib - 16-year-old Palestinian terrorist who tried to stab an Israeli civilian at the Gush Etzion Junction on Dec.1, 2015. Israeli soldiers at the scene shot and killed Al-Khatib. An Israeli civilian driving by in his car was wounded by shrapnel.